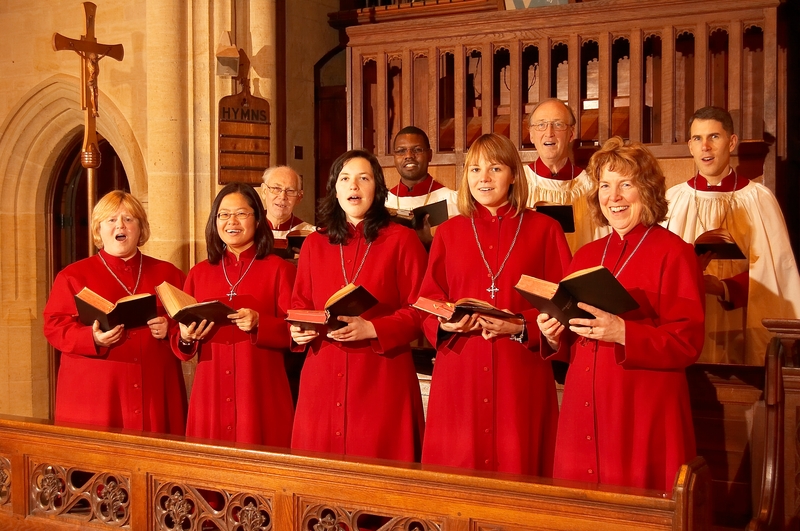 The choir has a long history which can be traced back over 100 years. A H Kimberlin’s The Return of Catholicism to Leicester 1746 – 1946 remarks that “In days before the Plain Chant was ordered by the Church Authorities to be the official medium of music during the church services, Holy Cross Church was noted for its excellent musical activities. The art of singing was studied, and instrumentalists trained so that great feast days were also gala days for music.” And the Leicester Advertiser of 11 May 1895 reported the first performance in Leicester of Gounod’s Messe Solennelle at the High Mass on the previous Sunday. Today the choir sings each Sunday at the 10.30 am or 12.30 pm Masses. The music at 10.30 is a blend of hymns, Mass Ordinaries that can be sung by the congregation, and the Offertory and Communion verses from the Dominican Graduale. At the 12.30 Mass we sing the Ordinary and Propers of the Dominican Rite Mass, with motets. We aim to use the most appropriate and effective pieces from the Church’s vast repertoire of sacred music, including Gregorian Chant, classical polyphony and more recent compositions, including items by our most recent directors. We sing from the gallery at the back of the church where we benefit greatly from the excellent acoustics of the building. Members of the choir also join the Community in singing Compline in Latin in the Dominican Rite, Holy Cross being the only community in the Province to maintain this tradition. This is on most Sundays at 6.20 pm. 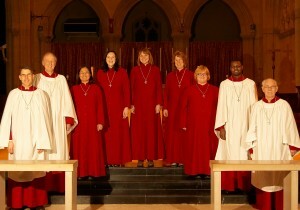 We also assist in singing at Benediction each Sunday 6.40 pm. We always welcome new members of the choir, and have a number of vacancies. Rehearsals are held before Mass, and after the 10.30 Mass twice a month. If you are not sure about your ability to sing in a choir, come and try – it’s the only way to find out! For more information, see any member of the choir on a Sunday, or contact Tom Keogh (via the ‘Contact Us’ page of this website). The first organ (built by J Porritt & Son of Leicester) was originally installed in the old church in 1861, and enlarged and improved in 1890. When the present church was opened in 1931, the organ was moved to a chamber on the south side of the choir, and it was hoped at that time to provide another organ with a console in the Lady Chapel which could have been used for services in the Lady Chapel as well as the church. In the event, no other organ was provided, and the original instrument, besides being too small, became increasingly difficult to play, so it was decided to obtain a new instrument and install it in the choir gallery at the west end of the church. The peculiar shape of the gallery made it difficult to find an organ of the required size and character which would not obscure the large west window. With the assistance of our organ consultant, Dr John Rowntree of Douai Abbey, and after several false alarms, we found a compact, sturdy organ built in 1880 by William Ebenezer Richardson for St Mary’s Church, Preston, Lancs. It has a warm, clear sound, very reminiscent of the marvellous instruments built by ‘Father’ Henry Willis at that time. It was completely restored by Peter Collins of Melton Mowbray who has an international reputation as a builder of fine organs. It is a three-manual organ (Great, Swell and Choir) with a 30-note pedal-board. There are 39 drawstops; but, strangely enough, the organ was never completed, and five of these were left inoperative, being prepared for only and needing only the actual pipes. There are some particularly fine reed stops (Trumpet, Cornopean, Oboe, Vox Humana and Clarinet) on the manuals. The action was originally mechanical (tracker action) but this was misguidedly replaced some time in the ’twenties by pneumatics. Peter Collins restored the instrument with modern tracker action which is much more responsive and is nowadays incorporated in most new organs. Our former Organist, John Whitworth, and Peter Collins felt very much that the instrument would be improved by the provision of a new slider chest with mechanical action for the three existing pedal stops, and enhanced to suit the acoustics of the church by installing a 16ft Trombone of a similar vintage. This extra work was finished shortly after the original installation and the organ, combined with the splendid acoustic of the church, has proved to be one of the finest in Leicester.